This photo is marked up as Blackpill/Mumbles Road. However no brick wall buildings at Blackpill can be recalled. It may well be Pontardulais or possibly Swansea Victoria but both could be wrong. The hanging notices could be LNWR as could the carriage on the left. However the uniforms do not look to be LNWR (possibly LMS?). Any information that you can supply will be greatly appreciated. The image comes from the John Hayman Collection. John's archive is now in the keeping of the history section of the Clyne Valley Community Project. This group are collecting information about the industrial history of the valley with the intention of providing waymarked paths in the valley telling people what was where and when. I don�t like to say it, but from what little can be seen of the coach I would say it is GWR with cream upper panels. Definitely not LNWR (bolection mouldings are cream) or LMS. We don't seem to be getting very far with this one but I would suggest the photo was taken in the mid-thirties by the mode of dress. This is based on the style of dress of the younger men. I was around at the time and recall the style. I believe I have the answer. I think it is Builth Road High Level - the Swansea end of the down platform. So, not really South Wales but with a clear connection from Mumbles Road via the Central Wales line. As far as I can tell from studying photographs there are no brick station buildings between Swansea Victoria and Pontardulais (inclusive) - they are all stone, wood, or a combination of the two. The photograph that clinched it as Builth Road is in Martin Smith's book Portrait of the Central Wales Line, page 31. Brick building, canopy out to platform edge with the odd extra extension, timetable boards at the end of the building and the office sign under the canopy. On the mystery photo the end timetable board appears to be lettered LMS at the top and GWR below - the GWR being almost below the posed gentlemen at Builth Road Low Level. 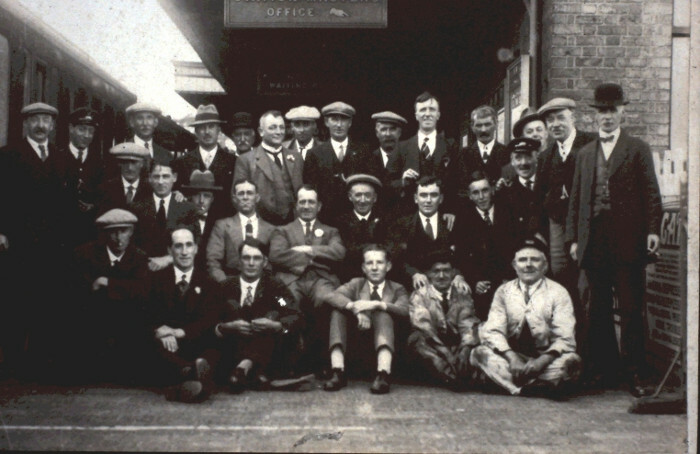 I guess the lads were on a day out from Swansea - these days it would be for the Royal Welsh Show, but I know nothing of its history from the 1920s/30s. Someone else will have to explain the coach.